Our go kart blueprints cover all you need to get your go kart frame built and assembled. How to guide in simple easy steps: parts and materials; tools needed; diagrams and assembly instructions; full color photos. We have a range of plans for all skill levels. Whether this is your first build or you are an old hand in the shop, we’ve got you covered! Go kart packages save you up to 70% off on all our plans. Get all our plans plus free bonus welding guide, speedometer plans, and more. Our plans our instant download. Print them out from your own computer in minutes. PDF guides readable on PC, Mac, or iPad. We have 7 different go kart plans for all skill levels. You can buy our kart plans individually or get them as part of a package for a great value. Take a look at our selection of plans below – click for more details and photos. These karts represent the easiest karts to build and are a ton of fun. All of them are great intro karts for a new builder or for the kids in the family! 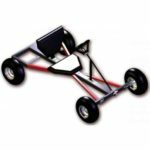 The Recluse is a great all-arounder which can be stretched for many purposes and is a great race kart. A great all around kart with wonderful opportunities for customization. Stretch or shrink to fit your needs, this is a fantastic design that produces a low weight, killer fast kart! Small but deadly. The Black Widow is designed to get you out karting in no time! Featured in Popular Mechanics and still a classic. A great beginner’s project but still tough! The Master Karts are a step up in complexity and attitude. They both feature swing-arm rear suspension, more aggressive brakes, and really tear it up. These are your classic back yard bombers and are great builds. With rear suspension and a big frame, it’s ready for action wherever you take! Sister to the Scorpion. A slightly more advanced kart and a ton of fun! Our killer three wheeled go kart design. It’s got a huge mono rear wheel with suspension that makes it a donut machine! Interchangeable sub-frame with Tarantula. The Pro Karts are our top sellers by far. Full suspension with with swing-arm suspension on the rear and independent A-arm suspension on the front. Rack and pinion steering. One or two seat models. These are the top of the line and very impressive. Our top of the line kart with front and rear suspension and a lot of attitude! With an aggressive look, and some aggressive performance. If you’re ready for a challenge, this is for you! The Grand Daddy of them all. This two-seat, dual suspension kart makes Karting a team activity. This is a really heavy duty machine that is a fun project to build. for 3 plans – 40% savings! for 5 plans – 60% savings! for all 7 plans – 70% savings!